(warning mtpaint-april64-3.44.93 will only work for april64 64 bit). Mypaint backgrounds which can be used by mtpaint tiling feature. New handbook is available here as a pet package. while mtpaint is running. Quit mtpaint and try again. of the same pet package so un-install procedure is needed. A simple install by double clicking. There should be no warnings . Install libgif first. There should be no warning. I compiled mtpaint using puppy431. -I tested package on wide variety of Puppies new and old. -I added a right click feature for Rox users. 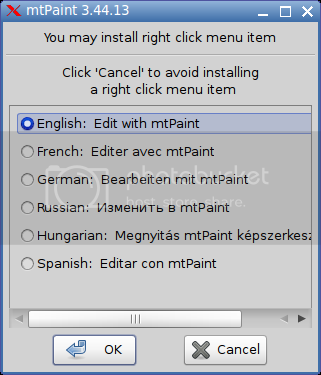 I put in a Hungarian right click menu item which can be chosen by user. I have been running this on my 3.01 box and only needed to install jasper from puppy linux 4 repos. I checked the Mtpaint website but I didn't find any mention of versioin 3.44.13. Is this a Git version or something? Yes. I got it from git. There is a link to git from the official mtpaint page. The current maintainer took the summer off for a vacation. As I did not noticed it at once , i have spent (...lost) time and lost some more hairs looking after gettexts headers (even have compiled it ..ca 21MB size !!). Yes a new version has come out. Versions beyond 3.44.20 are not really stable yet. I'm now rewriting the GUI in a toolkit-agnostic bytecode, which keeps getting changed as situation demands; and in the process, one little detail or another may get overlooked till chanced upon later (happened twice now). It would be helpful if the latest versions had someone other than myself testing them, to find out what (if anything) stopped working as intended in the newly-rewritten dialogs. But still, these versions are a bit more beta-quality than usual, not yet ready to be unleashed onto unsuspecting regular users. Added Dutch right click . I didn't notice any bugs. 0) Save the image as PBM. For writing all the weirder variations of image formats, there exist image converters, lots and lots of them. It would be just a waste of code to duplicate their functionality inside an image editor.